I’ve never read so many good articles and rankings on cities by growth, affordability, and desirability. Especially during a time when the real estate market is crazy! This study rates on three measures, population and housing, workforce and earnings, and business growth. So, you can decide which of these are most important to you or your kids. The only surprise in the top five is Provo, Utah. Austin is on top with its hip culture and restaurant scene. Then Provo comes in after Austin, with its dry, sunny weather. It’s less than an hour from Salt Lake City. Raleigh’s third with its research triangle and universities, followed by Charleston with its booming restaurant scene and massive tourism. Nashville, the country music capital, falls in right behind Charleston with strong tourism. Both of which are always bachelorette destinations, making them busy nearly year round with their mild climates. We had our last Irrational Economic Summit in Nashville. This year it’s in Austin. Maybe in the future we’ll host it in Charleston. Out of the top 12, five of the boomtowns are in Texas. None of them are in Florida. And 11 of those 12 are located in the sunbelt. Out of the top 36 boomtowns, 28 are tucked along the sunbelt. 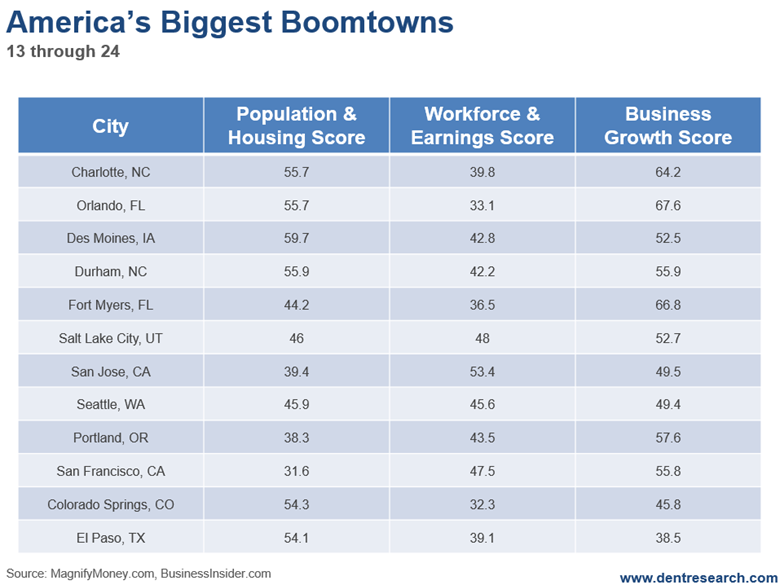 The top boomtowns for population and housing are: Austin at 100, Raleigh 84.1, Provo 79.9, Houston 77.7 and Charleston at 66.9. Those that lead in workforce and earnings are: Austin at 70.3, McAllen, Texas (a southern border town) 62.2, and Charleston at 66.9. And the top areas for business growth are: Provo at 95.1, Austin 93.0, Nashville 72.9, Charleston 71.1, and Raleigh at 70.8. 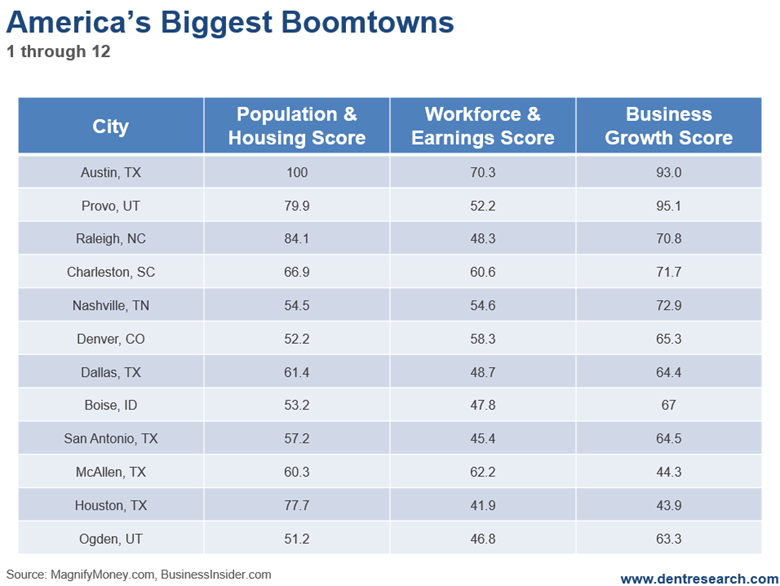 The boomtowns that standout most to me: Austin, Charleston, and Raleigh. These are some of the best places to consider moving to, especially for your kids. But the best strategy is to rent for a few years to make sure you love it, and to look for better buy opportunities when the next real estate decline sets in. Copyright © 2018 Harry Dent- All Rights Reserved Disclaimer: The above is a matter of opinion provided for general information purposes only and is not intended as investment advice. Information and analysis above are derived from sources and utilising methods believed to be reliable, but we cannot accept responsibility for any losses you may incur as a result of this analysis. Individuals should consult with their personal financial advisors.